I went up to Loch Ness recently for a brief one night stint. The drive up from Edinburgh took three and a half hours amidst changeable weather but there was enough periods of warm and sunny weather to enjoy the loch and its grand vistas. I normally do not go up on my own, so I took that opportunity to indulge in some good old fashioned monster hunting. By that I mean, just drawing up the car at some quiet spot by the loch with a good view and scanning the troubled waters for its elusive inhabitant. Naturally, the camera and binoculars were at hand. I took this brief video from one of those spots just north of Inverfarigaig on the quieter south shore. They say calm weather is "Nessie Weather" though whether that is down to the beast or the observer is a matter of opinion. My view tends to the latter, the creature is simply easier to spot on calm waters. I don't think the monster is bothered about the state of the weather above it, being a dweller of darkness. As I watched the dozens of one and two foot breakers continually agitating the waters, I could easily imagine missing a living hump surfacing briefly in a shallow manner. I sat in my car in a very sedentary manner scanning the loch whilst eating my Pot Noodle and mulling over various matters in my head. After all, to stare at the loch for three hours like some programmed robot is a bit taxing on the physical and mental faculties. Or to put it more bluntly, boredom can set in after a sustained period. That is why it is good to punctuate the session with some other diversions. In fact, the old met the new that weekend as I moved on from the old technique of watching the loch to collecting the trap cameras I had set up the previous August. There were three in total and they were all still in place when I got to them. Well, not quite. I had one camera strapped around a tree trained on the loch. However, when I got there, it was now pointing along the shoreline, a change of ninety degrees to the north. I speculated that some wag had played a trick on me and repositioned the camera. That view changed when I opened the camera and water poured out. The camera had not been moved by human force, but by storm force. Then I remembered that some weeks back, Loch Ness had experienced its worst storms in twenty years. The B&B owner had told me of their ferocity and how a fallen oak had narrowly missed their house. Viewers of Steve Feltham's facebook page will also recall how the waters at Dores Bay had nearly reached his home. Okay, I wasn't too hopeful that I would get anything from this camera, so I went back to the B&B and examined the cameras (whilst watching the Augusta Masters of course). The dry cameras were okay but had strangely recorded next to nothing, not even swaying bushes and furry animals. The flooded camera totally failed to power up in any way, which came as no surprise. The camera had been about two foot above the ground at its lowest level, but I can quite believe that this still allowed it to be partially submerged during the storms. Remarkably, the SD card inside had survived and I had pictures to look at! In all, it had taken a surprising 2100 pictures before the batteries packed in by late October. That was a lot more than normal and most of these were of waves breaking on the shore beneath the camera. In terms of specification, the camera takes a sequence of three pictures on detecting motion out to 15 metres. There is also an infrared sensor which will trigger the same run during the night. The first picture below was typical of the various images of boats that triggered the camera. Nothing remarkable there, but it gives you an idea of what to expect if a large creature swims by. The canoe below would be comparable in size to a single hump passing by and you can see there is sufficient detail in the picture to offer the hope of an unambiguous picture of a Loch Ness Monster - if it deigns to surface nearby! Otherwise, a lot of pictures were of the type below - waves crashing into the rocks below. At night time, the pictures take on a more surreal black and white aspect. Does the picture below depict a young Nessie trying to climb up a nearby rock? Not quite, it is the tail of a small mammal darting past the camera from left to right! I would guess it was a Pine Marten. What the next picture depicts is not entirely clear to me, but that looks like a paw on the bottom left. The identity of this creature is more certain - long neck, humped back, it has to be a heron! The next picture below is a bit more puzzling, what is the object poking out of the water at about 7 o' clock near the centre of the image? Unlike the other triple trigger images, there was only one image of this object. Since there are three rapid sequences of images depicting bright sunshine, I deduce it was the brightness of the sun that triggered the snapshot. But what was the object? Since it not a large object and its presence was fleeting enough not to trigger another image, my best guess is that this was a fish jumping out of the water. As you can tell from the next picture, somebody came across the camera. They clearly did not steal it, so I thank them for their civility in keeping it there. This is not the first time, the camera has snapped someone having a look at it, but this is now one time too many, so I think I need to find a more secluded spot! Overall, no Nessie pictures, but let us put this into context. The coverage of the camera is a notional 350 metres squared. The surface area of Loch Ness is about 56 million square metres meaning the camera is covering less than 0.0006% of the loch. In fact, I need to rethink how to point cameras at the loch. Two thousand pictures of waves ensured that the unit ran out of power during a run from August to October. However, the camera is meant to run from August to April! I clearly need to position the camera higher to exclude the waves moving in below. Sunsets are also an issue as a bright sun setting on the opposite hillside can trigger quite a few pictures as well. Back to the drawing board. Another venerable part of the tradition of monster hunting is talking to witnesses and other people around the loch. As I was coming back up from the shores around Altsigh, I got into a conversation with a local man who had lived in the area for over six years. After exchanging the usual pleasantries, it became apparent the local was a keen angler and so I eventually asked the inevitable question about the Monster of Loch Ness. Now, our man was sceptical of such a beast and likened it to believing in Santa Claus; however, he told a tale. Armed with torch and rod, he had gone out alone into the darkness to do some night fishing by the Altsigh. It was during this nocturnal angling that something unexpected happened. In his own words, he related how he heard a tremendous splash nearby accompanied by a "roar". At that point he belted up the slope and got as far from shore as he could. He demonstrated this "roar" to me and for all the world it sound like something guttural which I could not quite liken to in the animal world. It was a bit like gargling without water, if you know what I mean. Despite all this, he offered an explanation for his experience. 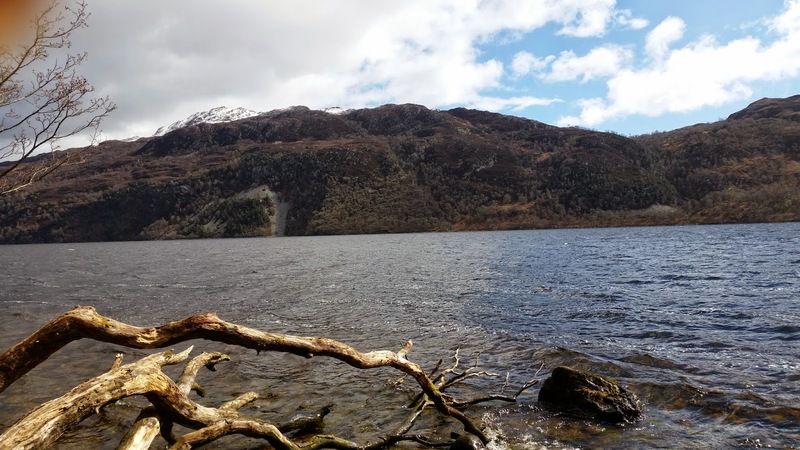 Since he could not clearly make out the form of the object near him, he concluded in the cold light of day, that it had been a deer which had come off the hills to swim across the loch. He explained that sometimes deer do this when shooting parties hunt them (although there was no shooting going on at that time of night). he had gone back to the shore and satisfied himself that he had found the tracks of the offending animal. As I pondered that story in my mind, his wife came up and joined the conversation. On mentioning this strange incident, she pointed out that he suffered heart palpitations for over a week afterwards. I could understand that happening, whether it was deer or not, but then she reminded him that he had told her that the dark form had reached above his own head height! I eventually said my goodbyes to them but immediately evaluated what he had told me. I didn't doubt that deer would on rare occasions go for a swim across Loch Ness, but the idea of deer tracks nagged in my mind. I had just come up from the beach in question and it is a mainly pebbled affair flanked by an incline of trees, bushes and grass. So I was wondering how a deer could leave tracks in that context. No doubt there are some areas where an imprint may be left (such as around the Youth Hostel), but nevertheless, if I had pressed him more, I would have asked how he knew those were the tracks of his presumed deer and why he had not heard the sound of hoof on pebble behind him beforehand. But, I will leave it at that, having recorded the story while it was still fresh in the memory. Meantime, the dashcam attached to the windscreen of the car continued to operate around the loch. Here is a clip of the run from Dores to Inverfarigaig. It is somewhere along this stretch of road that the Spicers had their famous view of an unknown creature lumbering from their left, only to disappear into the foliage on the other side. Sunday morning began very wet as I left the Bed and Breakfast and I wondered whether it was worth doing anything else. But the sun was not long in coming out for a final stint of good weather and so (as mentioned above) I headed to Altsigh were two sightings of note occurred. The first was the land sighting by Alfred Cruickshank in 1923 and I will return to that in a future article. The second was the close up sighting by John MacLean in 1938 where the Altsigh burn flows into the loch. I clambered down the bank near the Youth Hostel and made my way to the estuary to take some pictures for the MacLean article, but I also add them here. The first picture is looking up towards the Altsigh burn from the loch. The next view is of a small spit of land bisecting the river to the right and the loch to the left. It is not known whether this spit existed in 1938, but I could imagine John MacLean standing there casting his fishing line as a creature beyond his expectations surfaced only sixty feet from him. And, finally, looking across the loch from this small shingle beach. After exploring this region and just generally watching the loch under the warmth of the sun, it was time to head back south to Edinburgh. I hope to be back in May. In the meantime, I include another dashcam footage as I headed out of the village of Foyers heading south. It was along this stretch of the road that the curious case of Lt. Col. Fordyce happened.